Who can access the VCL? How do I connect to virtual desktops in the VCL? How do I change the VCL window size? How do I print from the VCL? I lost my network connection. Is my work lost? Why does the VCL run slowly or crash when I run some applications? The VCL (Virtual Computer Lab) is a service that enables users to schedule a time to connect to virtual desktops, which run specific academic software applications, from their own computers at any time from any location. Detailed instructions for connecting and using the VCL can be found here. Currently enrolled Illinois Tech students, faculty, and staff can access the VCL environment. Due to license restrictions, however, specific access to the majority of VCL images is limited. The entire university community can access Linux images, but access to Microsoft Windows OS images is currently limited to the students and faculty involved in specific IIT courses. Users will only be able to see those images to which they have been granted access based upon their class enrollment. You can only have one reservation for a specific day/time, however, you can schedule multiple reservations for other times within the same day, provided the reservations are not contiguous. You can also “Remove” or “Delete” reservations from the “Current Reservations” tab in the VCL reservation system. In order to connect to Windows Virtual Machines in the VCL, you will need a Remote Desktop Client on your device. Windows OS – The Remote Desktop connection is included in Windows 7 and above. Mac OS X – A Remote Desktop Client will need to be downloaded from Microsoft. In order to connect to Linux Virtual Machines, you will need an SSH Client and an X Window System on your devices. Mac OS X, Linux/Unix – SSH Clients are included and can be accessed by opening a terminal window. Mac OS X – Install X11 is included with OS X install media. Linux/Unix – It is included in OS builds. If you connect to the VCL by entering the virtual machine IP address into your computer’s RDP client, you can edit the RDP window size directly in the RDP client. You can print from the VCL to the Illinois Tech Remote Printers in the same way that you do from your own computer and retrieve your document when you are ready from any IIT Release Station. You can also print to a .pdf file using the installed BioPDF writer and download it to the computer you are using and then you can utilize the connected printer. You may be able to print directly to the printer connected to your own computer, but many printer models are not compatible with the VCL system. Remember that once a VCL session expires, any work not saved to your local computer is lost and it cannot be recovered. Copy saved files back to your computer or Google Drive. How you transfer files between your local and virtual machine depends on the OS on your local machine. 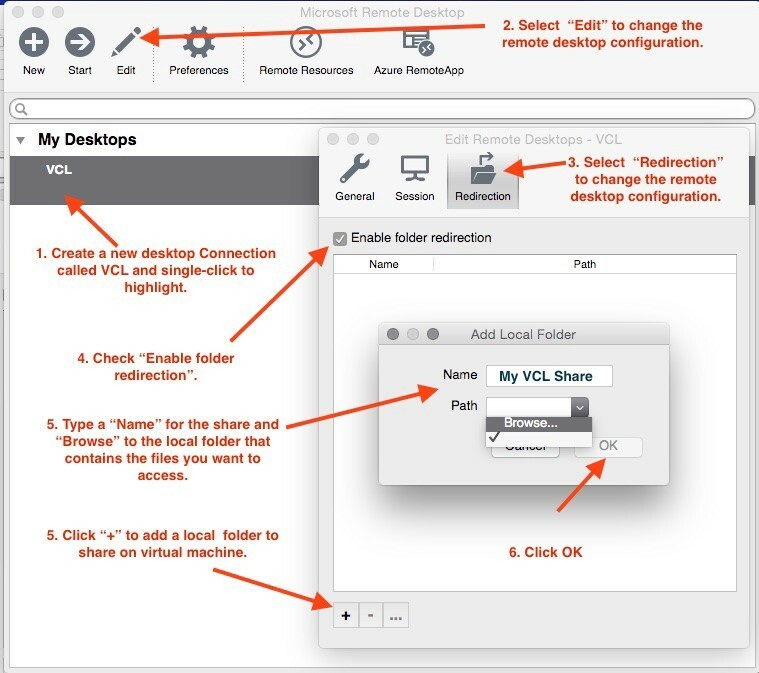 Configure a VCL connection within the Windows RDP application that permits sharing between your local and virtual machines. Save the connection and manually edit the IP address with the new VCL virtual machine IP address for each new reservation. If you are connecting from a Mac OS X computer, you will need to configure a Microsoft Remote Desktop connection configured to allow for folder redirection. Open the Microsoft Remote Desktop application on your Mac and follow the instructions on the image below to arrange for folder redirection. If you wish to use files from your Google Drive, or save files to your Google Drive, you will need to access your Google Drive using the browser on the virtual machine. I lost my network connection, is my work lost? will have either 15 minutes or the regularly scheduled expiration time of your session, whichever is shorter, to reconnect and retrieve your work. If you are disconnected from an SSH session on a Linux image, you will be able to reconnect to your session without losing your work, but it will be just like opening your initial session; none of your programs will remain open. Why does the VCL sometimes run slowly or crash when I run some applications? For best results when running software applications in a Remote Desktop Environment, always copy data files to the virtual machine and open them on the VM drives. This reduces the chance that an application will crash or run slowly because the VM is constantly trying to read or write data to your computer over the network.